Sit on the side of a bench and place your hands on the edge of the bench, by your hips. Move your feet forward a little and slide your bottom off the bench so that your body weight is supported by your arms and your knees are bent at 90-degree angles. Keeping your torso upright and your elbows close to your body, inhale as you lower your body by flexing your elbows. Exhale as you raise your body by extending your elbows. Do not lower your body beyond feeling a mild stretch in your shoulders. The point of keeping your torso upright and your elbows close to your body is to keep the emphasis on your triceps brachii instead of on your pectoralis major. Make the bent-knee bench dip more difficult by extending your legs farther out. 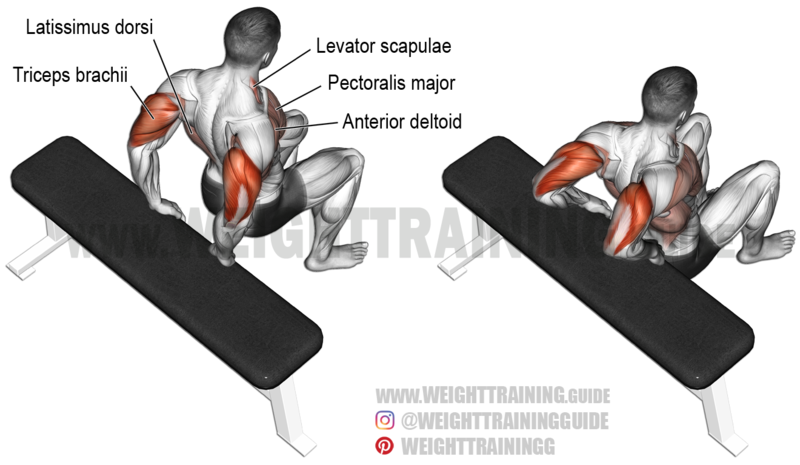 See also the bench dip and the triceps dip. Ηi there, you’ve done an incredible job. Learning new exercises every day from your site.